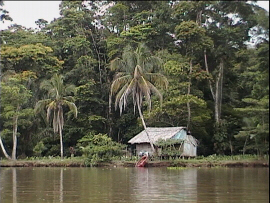 "I wanna go back to that little grass shack in Tortuguero..." A typical dwelling along the Rio Paquare near Tortuguero embodies the feeling of the Caribbean region of Costa Rica. Days are hot and muggy, nights are cooler and filled with incredible sounds. Better take some insect repellant (only DEET-based repellants really work) if you plan on hiking or visiting the jungle while around Tortuguero - but why else would you be there? This is a great place to observe the White-collared Manakins, and if your there during breeding season (May-June) you may be able to see and hear the males on their Leks. A Lek is an arena that several male birds set up in order to display their wares to admiring (and discerning) females. Males compete with various displays, depending on the species and get to mate with females who are impressed. These Manakins display by calling and snapping their wings together in loud Cracks! that sound like rocks hitting together. Clear-winged Butterflies are common in the Cloud Forests at Monteverde and Santa Elena. When they fly, they look like fluttering fog - a strange sensation, and a very pleasant one! Andrew especially liked these guys, and he was always good at spotting the small, beautiful things on this trip. Everywhere we went in Costa Rica there were spectacular butterflies - Morphos, Heliconids, Giant Pierids, and Papilionids that look like Heliconids and Pierids that look like Papilionids, and Danaiids that looked like... you get the picture. It's always "Look at THAT! ", in Costa Rica! 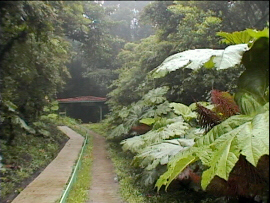 The path leading to the entrance at Santa Elena Cloud Forest Preserve sets the tone for the whole experience. Soft, green, luscious beauty. Every step through this, my most favorite preserve, is like walking through a wonderland of plants and flowers and trees and butterflies and birds. I could spend hours getting down the path 20 feet if left to my own devices! The visual impact of the dense wet forest shrouded in fog coupled with the sounds of a thousand birds punctuating the mist is almost more than a mere mortal should be allowed. Go there. Do not miss Santa Elena. There's only one beer to drink in Costa Rica - Imperial! And there's no reason to look for another - it's tasty and cold, and exactly right with Gallo Pinto at night. While we're on the subject of vice (is drinking beer a proper vice?) both prostitution and gambling are legal in Costa Rica, but neither seemed to be a problem for the public. We never saw a prison, and saw very few police other than the traffic cops on Highway 1, who were mainly looking for stolen vehicles. The Montezuma Oropendola is a magnificent, crow-sized relative of the Oriole that builds communal nesting sites like this one in a large fig(?) tree near La Fortuna. These nests were full of noisy young birds when I was there in June - you can hear them talking to their parents in the sound sample. The hanging basket-nests are a common sight throughout Costa Rica and the unearthly crackling, squeaking, crying call is something you won't soon forget!